As a small business owner, you must stay on top of your expenses. Keeping track of your receipts is what will help you stay on top of your costs, stay out of trouble with Uncle Sam and help you manage your cash flow. Staying on top of your costs. Keep track of your receipts helps you stay on top of your costs by putting it right in your face. When you are tracking your receipts you are constantly aware of where each dollar and cent is being spent. You become more aware of what you are spending money on and how often. Staying out of trouble with Uncle Sam. When Uncle Sam shows up you want to make that you are ready for every request he throws your way. There are certain guidelines around how long you should keep copies of all of your documentation. But when that time comes when you are under the bright interrogating light, you want to be certain that you can re-produce the requested items to help validate your expense. Without proper documentation a deduction can be disallowed. And disallowed expenses mean you not only have to pay additional taxes but also penalties and interest. As I said above, when you are track your receipts you are constantly aware of where each dollar and cent is being spent. This makes you keenly aware of the cash outflows in your business. Being aware of your cash outflows forces you to be aware of when and how much cash needs to flow into your business to keep your accounts out of the red and in the black. 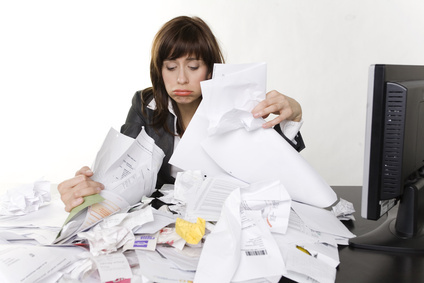 Here are 2 of the best tips for maintaining clutter free accounting records. Use a receipt document management system. Using a cloud document management system helps keep all of your receipts in an organized manner. We use Hubdoc, which allows us, and our clients, to keep electronic copies of every receipt and statement that is produced. Cloud document management systems helps us not only keep records organized but also makes it easy to locate documents when you need them. You simply create a filing system similar to a large file cabinet and you will have no problem locating documents. Categorize your receipts before storing them. Categorizing your receipts helps you, or your accountant, to record your receipts and invoices in your accounting system. By simply writing on the top of the receipt what the receipt was for, then uploading into a system such as Hubdoc, we can easily post the transactions to the appropriate expense bucket without bothering you, the client, with a slew of questions. I believe using a cloud document management system is a key element to financial organization. And good financial organization leads to better business decisions. What cloud document management system do you use and why?